Your dog will be a blushing bride in this white wedding tutu costume. 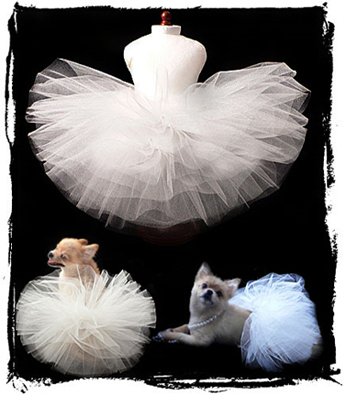 This dog pettiskirt tutu can be used for a Wedding, Family Photos, Holiday party, Birthday or Special Event. The combination of layers and layers of aqua and black tulle is used for this dog tutu. Barette is included. This product is custom made to order in the USA. This item usually ships within 6 to 7 business days. Our products are shipped using the USPS, Fedex or UPS.